Have you ever seen the rock musical, Little Shop of Horrors? I suspect that Audrey II (a plant that thrives on human blood and has aspirations to take over the world) may have been a zucchini plant. Every morning when I run out to my garden to pull a few weeds before work, I’m always amazed at the zucchini’s ability to grow overnight. I always try to pick them while they’re small, but every now and again one will escape my attention and grow into a baseball bat. 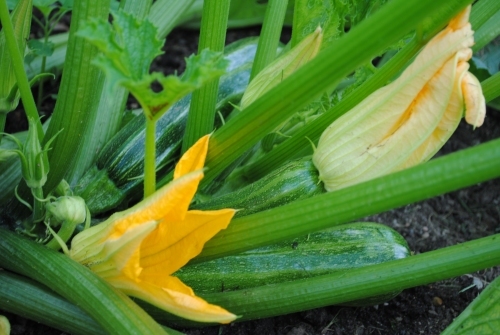 I’ve got a friend who says during zucchini season the people in her town have to lock their cars when they visit people, or a few zucchini will be slipped into their car while they aren’t looking. Every year, as my zucchini start setting fruit, I go on the hunt for new ways to use it. 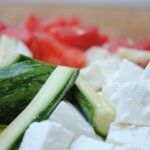 I sauté it with other veggies, pasta, and feta for quick meals and use it raw with vinaigrette in salads. 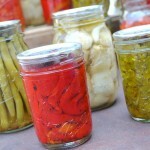 Ever since I was a kid, my mom has always made a “pickle” relish using the prolific veggie. 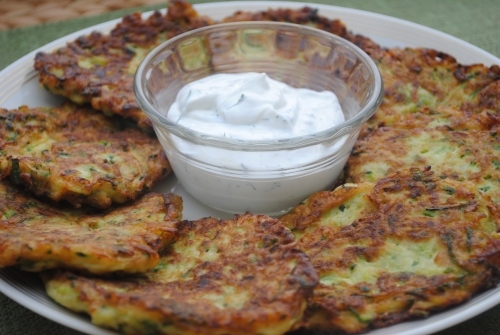 I recently made zucchini fritters based on my recipe for potato latkes. Because zucchini doesn’t contain the starch found in potatoes, I did bump up the amount of flour. I really liked these, but my guys are veggie challenged and weren’t big fans. I probably won’t make them as much as I would like to. 2. Place grated zucchini on a piece of cheesecloth or a dish towel and twist to wring out as much excess liquid as possible. I use a dish towel and place the zucchini in a long strip (lengthwise) down the middle of the towel. 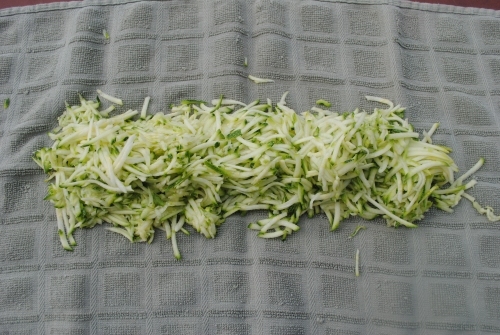 Next, I fold the sides of the towel over the zucchini, grasp the ends of the towel, and begin twisting. 3. 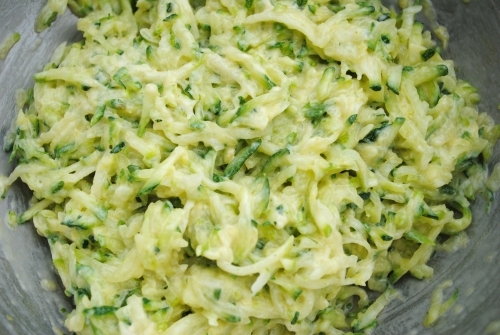 Place zucchini in a bowl with the shredded onion. 4. 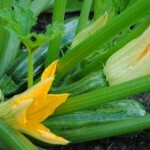 Combine yogurt or buttermilk and egg to the zucchini mixture. **Chemistry Alert** Using baking powder and some type of acidic milk will provide a little leavening in the fritters. 5. 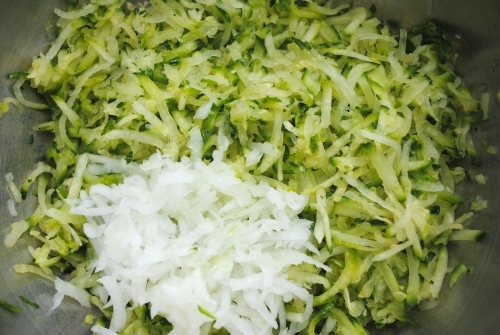 Stir flour mixture into the zucchini. 6. Heat olive oil in a skillet. A note on olive oil … don’t use your good extra virgin or virgin grade olive oil for cooking. Instead, use the pure grade olive oil which is more refined, and has a higher smoke point. 7. Using about 1/4 cup of the mixture, form zucchini patties in the skillet. Cook fritters for 2 to 3 minutes on each side, until firm. Turn again, cooking about 30 seconds more on each side until golden. 8. Remove from skillet to a paper towel lined plate. 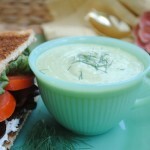 Season with salt and pepper and serve with yogurt dill sauce or Tzatziki, a traditional Greek cucumber-yogurt condiment. I’ll try to remember to post a Tzatziki recipe in the next couple of weeks. 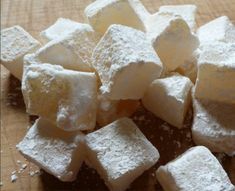 Thin some Greek style yogurt down with a little milk, or use plain yogurt. Mix in some snipped dill and season to taste with salt and pepper.